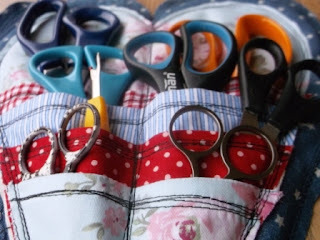 This cute scissor keeper could probably made from scraps left over from other projects, and the denim backing could even be cut from old jeans. 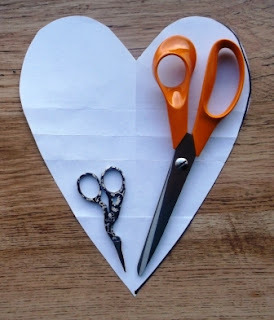 Whatever you use to make it with, the heart is a perfect shape for scissors - the pockets form a natural point and hold the scissors neatly in place. It's really easy, even for a beginner. it can hold a lot of pairs of scissors! If you like the sketchy style of stitching I've used then choose a contrasting thread (black is good on most fabrics, and gives a natural outlining effect) and a slightly longer stitch length on your machine. Aim for a little wobbliness in your stitches, and stitch each seam three times or more. It looks like free machine embroidery, but it's a simpler way of achieving that fun and informal look, especially on long straightish seams. However, if you don't like the whole sketchy feel of it and want a neater-looking finish, you can simply use a straight stitch and a matching thread. 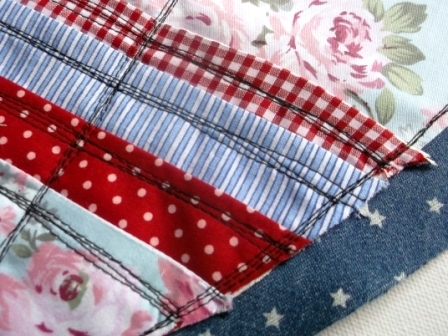 The design makes use of raw edges, but could be adapted to folded edges - however, I would use fewer pockets in this case as you'd increase the layers of fabric being stitched at one time. You could also use felt for a neat finish. 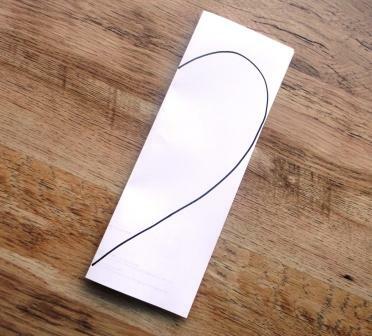 Start with an A4 piece of paper (if you are in the USA or Canada, use letter size paper - it's close enough in size to make no real difference) fold it vertically and mark half a heart shape. Cut the heart out and open out the paper to form your first template. 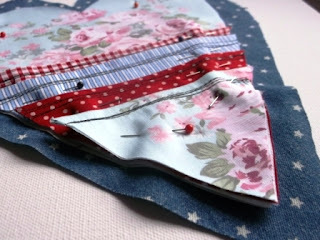 This is the inner heart - in my version it's the floral fabric. 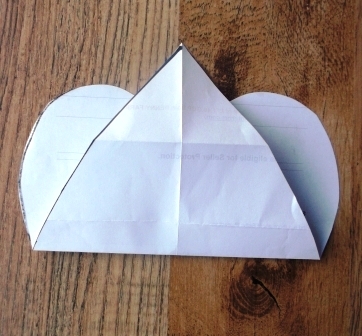 Use this template to cut another heart template, around an inch wider all round (if your cutting skills are not so good, measure 1" out from the first heart shape as you go). You could use newspaper for this template if there's nothing else to hand. 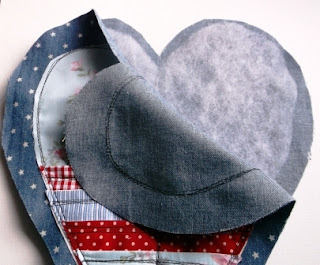 Cut 2 hearts from denim and another from wadding (I used 2oz) using the larger template. Trim the wadding one so it's just a little smaller all round than the denim. Check the size of your scissors against the A4 heart and decide how big you want your pockets to be and how many of them you want. 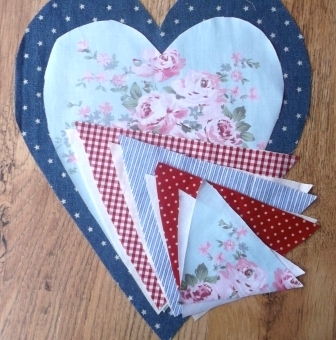 Using the template from the A4 paper, cut one heart from cotton print, and as many triangles from the bottom of the heart as you need. Cut two each of each triangle. You can see mine are all backed in plain white cotton - it's up to you if you want to do the same. It means you can save your best "scraps" for where they'll be seen! I'm not sure if that's really sad, really scrimpy or just plain common sense! Place the triangle shapes right sides together and stitch across the top edge. Press and turn to right sides. 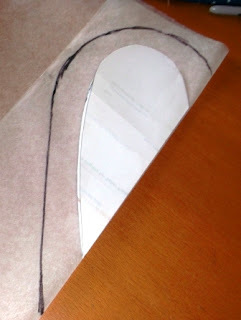 Trim the excess fabric off the top corners. Stitch a line centrally along the middle of the heart, dividing each pocket into two. Sandwich the wadding between the two denim hearts. Push the two ends of some tape, ribbon or string into the two top edges of the heart to form hanging loops. Sew around the raw edges, paying particular attention to the hanging loops, making sure they are secure. 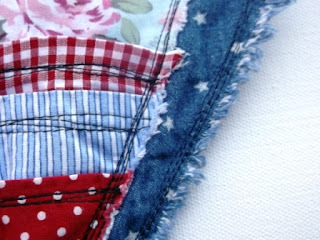 Pop it into the washing machine to fray the raw edges of the fabrics, especially the denim. And there you go - it's done! 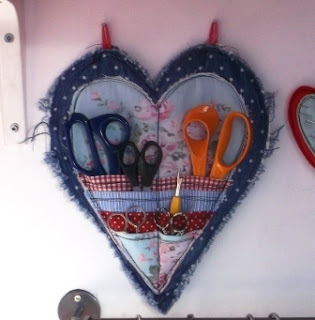 I think it looks good on the wall next to the sewing machine - and it might just help make sure the right pair of scissors is always to hand! Great idea and super clear instructions too! Thanks. I think this is a great idea! Not only for crafters but for children's craft areas too. Ooh yes, it would be good for a children's craft area! You could get pens and crayons in there too! Já vou fazer um... ai você fica de olho no meu blog para ver a postagem. Porque quando eu terminar de fazer vou postar. This is lovely. It is not only pretty, but it should protect the points of the scissors as well. Great idea. What a great idea! Thank you so much for sharing! I love this idea! 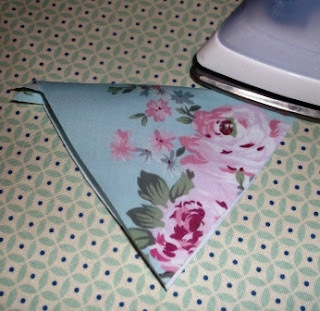 I'm going to make one with fabric that matches my curtains. I also have a rod I got at Ikea like you have in the last picture. I currently hang my rulers on it but it looked sort of sloppy so now I'm thinking of changing to a peg board. I just thought it was interesting someone else thought about using the rod in the sewing room. Thanks! Love it. But then I love scissors and I love hearts. Thank you for sharing your cleaver ideas. Hi Wendy! 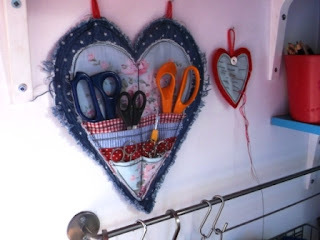 I just made myself a scissor keeper today!!.. And I'm very happy with how it came out! If you'd like, maybe you can take a peek. Here is my blog link so that you can see it. Made one for myself today :), I've linked back to you in my blog post about it. Thank you very much for this great idea and tutorial. Love, love, love it. Giving these scissors keepers to my daughters-in-law for Christmas as they love sewing. I will add a little bit of hand embroidery. Thank you for this lovely tutorial. Would you mind if I posted a link to this tutorial on my web site? We are raising funds for The Quilters' Guild of the British Isles (registered charity)next August by making heart shaped items for the tombola at Festival of Quilts in the UK. Jan - absolutely yes. I'd love to hear more about what you make, do let me know! Very cute! Thank you for sharing your pattern and tutorial! I'm GONE on this AND your blog. Newest follower! Sorry to sound dumb but what is "A4" paper? Guille, I'm guessing you are in the US or Canada? I only recently found out you guys don't use A4. It's similar to letter size: A4 measures 8.3 x 11.7" as opposed to 8.5 x 11". it won't make much difference using letter size paper. Sorry for any confusion, I'll update the post. Beautiful and very great idea! Thank you for sharing! Have a nice day! Thank you so much for the pattern and tutorial which was really easy to follow. 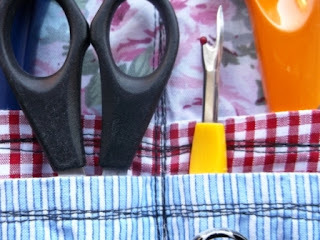 This is a really useful item for me as my tidy husband is always "putting away" my sewing equipment which means looking for stuff before I can get going on my latest project. At least now I can always find my sewing scissors! 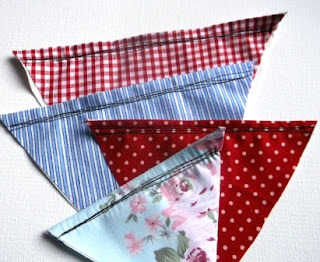 Thanks again - I do enjoy reading your blog and the other blogs on Handmade Monday. WOW, this is totally awesome and i just fell in love with your design..
LOVE THIS and must make this for sure.. I made two of these today. I love them.. They turned out great. The only thing I did extra was to iron on a stiff lining to the back along with the batting. 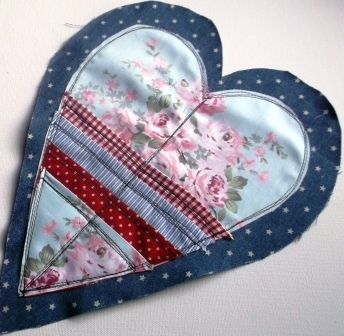 It gives it more stability..Love love this..
Well I know what all of my SEWING friends will be getting for Christmas. If I start now I should be able to do enough for each member of my local group to get one. Thanks for the tutorial. This is exactly what I need to get that cup full of scissors off of my desk! And there's a spot on the wall that would be just perfect to hang the heart. Thanks so much for the idea! You had a really nice blog. You must try to make your business a commercial one to make it known to those who can make some amazing profit for you. This is really going to make it more amazing and interesting for you and others. What a great idea! I am always looking for the right scissors so tomorrow I'll get out the denim shorts I was supposed to put a zipper in and make this instead. Thank you! Creative suggestions - For what it's worth , if your business is searching for a CA FTB 590 , my friend filled out and faxed a blank form here https://goo.gl/2LS4go. Great show!! I was only a few days ago trying to visualize a pattern for a wall hanging for all my scissors. This is so right-on-time and perfect. And it is very attractive and seems easy to do. Thanks a lots. This is perfect for what I need, and it's SO pretty!! I plan to make several for gifts! Thank you for the pattern.